What on Earth is RSS? A feed is a special function that allows feed readers (which can be separate programmes or web pages) to access sites and look automatically for new content and pull it down into one place for easy viewing. Specifically this allows users to keep easily up to date with their favourite blog’s content without having to waste time by frequent checking of multiple blog sites. There are several different kinds of feeds which can be read by different feed readers. Some feeds include RSS (which usually stands for “Really Simple Syndication” or sometimes “Rich Site Summary”), Atom or RDF files. Well this is the really cool part. Instead of checking your 50 favourite blog sites for new posts each day, you link them to your feed reader via RSS. This centralizes new content which only shows up when present. This saves you time and potentially lets you review more blog sites. To learn more check out Mezzoblue’s What is RSS/XML/Atom/Syndication? At the bottom of my website’s pages, on the left-hand side, you will see a little orange icon which says “RSS Feed” when you hover over it. You should also see the feed address pop up over the top of the copyright notice on the right-hand side. Click on the orange icon and, in Windows using Internet Explorer, you will be taken to the blog content in the built-in feed reader, and have an opportunity to subscribe to my blog. Otherwise you can enter the feed address into your favoured feed reader (I use FeedDemon). Having a little time over Christmas (a change to say the least) I thought I would go ahead and update TDI with the new galleries. Having not blogged since last March, I could barely remember how to enter admin mode (had even forgotten my password), so creating a new menu system was an even larger hurdle. Never mind, I was up for it… Unfortunately I realized that multi-level menus were out of the question with my previous theme as they were just as long as menus without sub-levels, and there were just t00 many galleries. So guess what. I had to re-organize my galleries to be larger and fewer. Took ages (and I was not amused once more!!). Worked hard, got it all done, felt very pleased, theme fell over. No slide show on the home page. Ahhhhh!! No Help from Theme Authors.. I emailed the theme authors, but no reply. Emailed again, but still no reply. What a nightmare, looks like they have gone out of business – still economic times are hard and there might not be a very large market for something so specialized – but here’s the thing… I really liked that theme. My choices were few. I could learn (actually re-learn) HTML and learn JScripting (for the first time), the WordPress architecture and something about theme writing and thus fix it myself. Or purchase another theme, re-do all my galleries, re-design my homepage and get to grips with unfamiliar settings. Neither seemed much fun, but I chose a new theme. It took longer than I thought, but eventually themeforest came to the rescue with an excellent theme called Photolux from Pexeto Themes. It’s very popular, reasonably easy to use and very attractive with a simple style. I’ve been able to reuse my old galleries pro-tem so that’s a help, but not a permanent solution because the full-screen images that this theme can do look so much better. One of my plugin updates caused an internal server error taking me off-line. Nevertheless I’m delighted to say that everyone has been very helpful. The GoDaddy technical support was excellent (did you know that their European office is in London? ), and the plugin author is being very helpful too. Well, things did take a turn for the better in the end, and I finally got the strawberry falling into water shot that I wanted. As much as I enjoy my wildlife photography, I do also enjoy the controlled circumstances of the studio, and I’ve had several goes at this shot previously. My daughter was keen to help out and took some of the shots herself with her D3100 and Sigma macro lens combination, so this is a combined effort. Unfortunately I didn’t quite have the correct kit to get the shot the first time round as I needed a longer container. 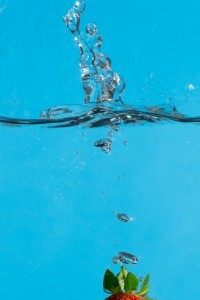 This image is taken using a flat sided glass vase to hold the water, and they are available quite cheaply in many stores (see picture below). The strawberry is carefully chosen for size and shape, side lit with a small strobe and the background is lit with 2 other flash (it’s actually a piece of A3 blue card). It’s important that the vase is tall enough to get both the strawberry and the splash, and the position of the light is important because you don’t want any stray highlight reflections on the glass. The greenery on the top of the strawberry is best retained in my view. It may look untidy when the strawberry is out of the water, but usually looks fine when it is beneath the waterline, so you don’t have to be that fussy. It is not really possible to get this shot in one go because the splash occurs when the strawberry is much lower down in the vase, and therefore the angle of view of your macro (or telephoto) lens is too narrow to get it all in. 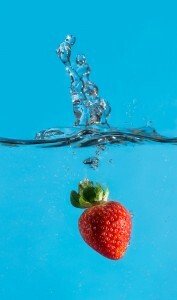 So to get both the strawberry and the splash-back in this pleasing aesthetic you need to merge two shots in Photoshop. In order to make this possible shoot everything in manual in the same way you would with a panorama. Obviously you have to be quite patient to get both parts of this shot correct. Expect lots of missed strawberries mostly out of shot, lacklustre splashes and don’t forget to pre-focus on the strawberry in the centre of the vase before you drop it!! You will need to crop out the sides of the vase because this makes it very difficult to merge the two shots. The inside surface of the vase can get covered in distracting water-droplets as the number of trials increases so it is important to watch out for this and periodically wipe the inside surface with a piece of kitchen towel or similar. As with anything electrical and involving water, make sure your flash equipment is sufficiently distant not to get splashed. They can be covered by plastic bags if needs-be. I found that at the distance I was using no droplets landed near to the flash units. Manual flash exposure tends to be more reliable than auto and don’t forget to use a manual white balance, plus any correction you might need post shot, for both images before attempting the merge. Given that it is the speed of the strobe flash that freezes the action it is important not to have too much ambient light for the ISO/Shutter Speed/Aperture combo that you are using in order to minimize the potential for speed blur. To judge this take a test shot with the flash turned off. the darker the frame the better. 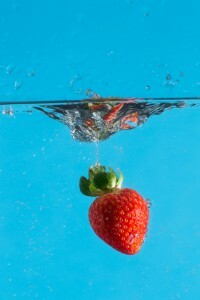 Here are the two shots I used and you can see clearly how the splash begins as the strawberry moves out of frame. As you can see I might have been better off shooting higher for the splash since the splash was almost cropped by the top of the frame. A good trick for centring the strawberries prior to focussing is to skewer them and hold them in place. If you do this though, remember not to go right through the strawberry because this doubles the risk of being able to see the exit wound on the face of the strawberry, the top one is usually out of sight but one on the front of the strawberry may not be, as happened here. The clone tool came to the rescue easily enough, but it is best completely avoided if possible. Alternatively you can copy a patch of strawberry that is similarly lit up onto its own layer and then move it into place and mask the edges with a soft brush to obscure the repair. Don’t forget to match the spacing of the seeds though, otherwise the repair will look odd. Finally I painted out some of the more distracting water droplets on the inside face of the vase (this is an advantage of using a flat-lit plain coloured background), sharpened and saved the image. Focal Length = 220mm, Aperture = f11, Shutter Speed = 160th Second. My new year’s resolution is to try to blog at least once a month and to always have a new image to show. I’m becoming curious about social networking (my wife says it’s a jolly good thing in business). I’d quite like one of those social media icons on my home page – but I’m not sure I can commit to the regular stream of content (however short or inane).